Stainless steel case with a stainless steel link bracelet. Fixed stainless steel bezel. Mother of pearl dial with luminous hands and Arabic numeral hour markers. Minute markers around the outer rim. GMT scale. Date display at the 6 o'clock position. Swiss quartz movement. Scratch resistant anti-reflective sapphire crystal. Protected steel crown. Stainless steel case back. Case diameter: 32 mm. Case thickness: 7 mm. Deployment clasp. Water resistant at 100 meters / 330 feet. 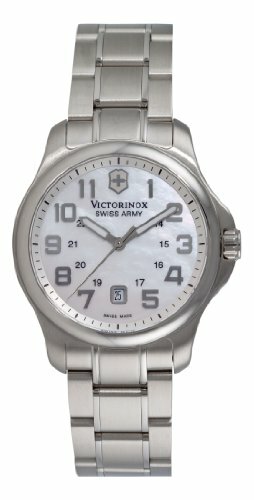 Victorinox Swiss Army Ladies Officers Mother of Pearl Dial Watch 241365.